Smartphones have become the center our lives – our connection with the world and the world’s with us. This means they are always close, whether in your pocket while at work, in your hands when using, or on the bedside table while you sleep. The proximity to our smartphones, however, directly contributes to the levels of radiation we are exposed to. The German Federal Office for Radiation Protection has a database of smartphones and the level of radiation they emit. 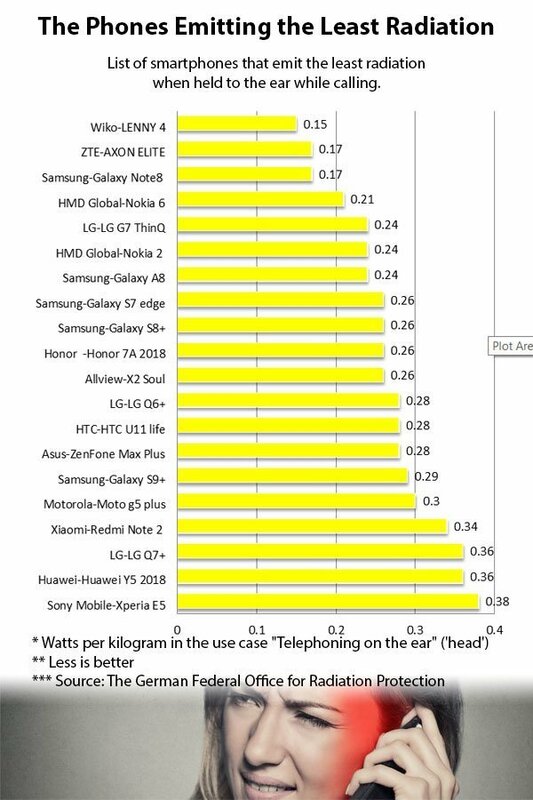 According them, the smartphones creating the highest level of measured radiation are the LG 510W and LG 512 with 1.94 watts per kilogram and the Blackberry Bold 9790 with 1.86 w/kg. 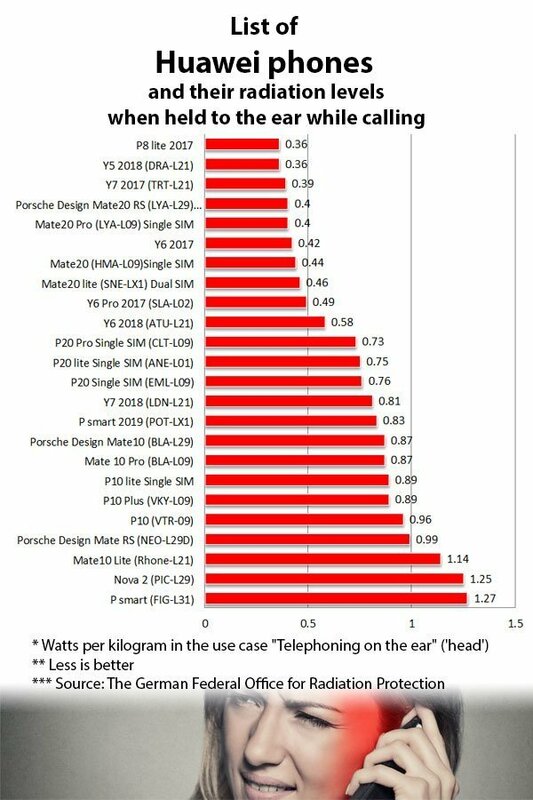 From the currently available models, the Allview P7 Pro and the Mi A1 from Chinese vendor Xiaomi measure the highest with 1.82 and 1.75 watts per kilogram, respectively. Another Chinese phone is in third place – the OnePlus 5T. Apple phones, such as the iPhone 7 and iPhone 8 are also on the list of high radiation phones, as are the Pixel handsets from Google. So, what is a ‘high radiation phone’ and what should a ‘normal radiation’ phone measure? Unfortunately, there is no universal standard for normal or safe level of phone radiation. On average, most phones emit between 0.5 and 1.0 watts per kilogram. However, the German Certification for Environmental Friendliness ‘Der Blaue Engel’ will only attach its certificate to phones with specific absorption rate of less than 0.6 watts per kilogram. You’ll notice the phones featured in our infographic measure at more than double this level. 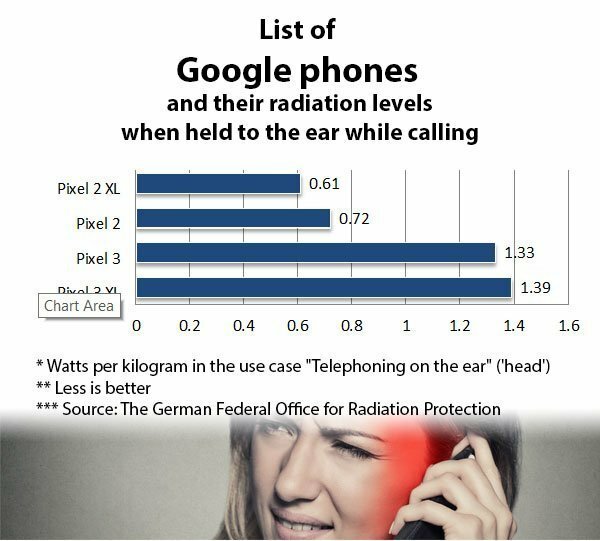 The following infographic shows smartphones that emit the most radiation when held to the ear while calling. Having seen the highest radiation phones, you might be curious to find out which phones emit the least radiation. The German Federal Office for Radiation Protection obliges again. According them, the smartphone creating the lowest level of radiation ever measured is the now long discontinued Samsung Z560, released in 2006, with just 0.1 watt per kg. 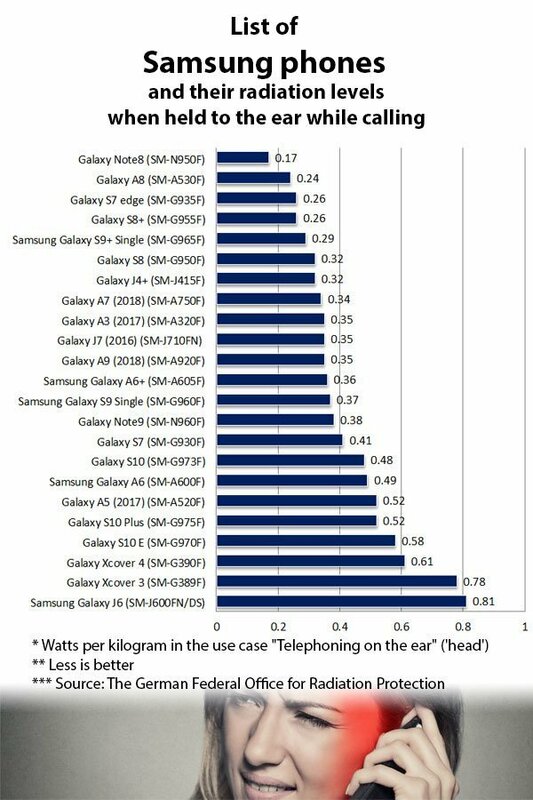 From the current models, the Samsung Galaxy Note8 leads the pack with a specific absorption rate of 0.17 watts per kg. In fact, Samsung handsets feature prominently on our list. However, we have noticed a trend with increasing radiation on newer Samsung models. 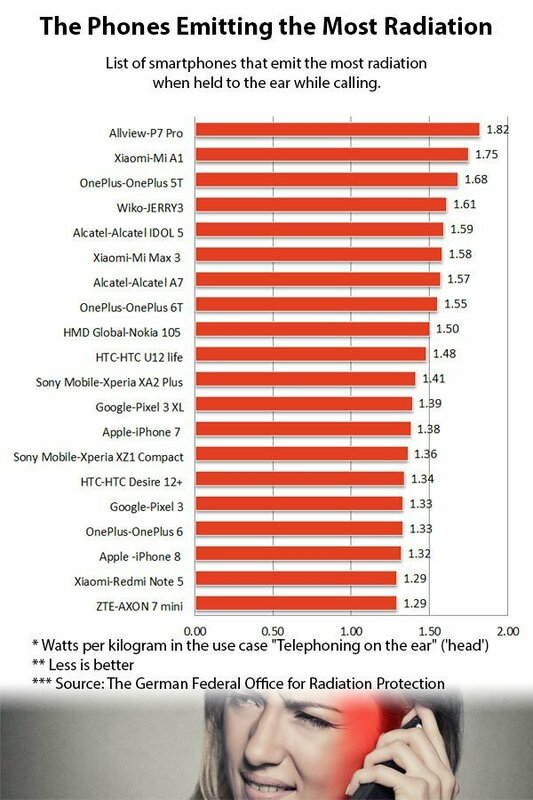 For example, the newer Galaxy Note9 measures 0.38 watts per kg, while the old Note II just 0.12 watts. Also, the Galaxy ‘+’ models, like S8+ and S9+, emit less radiation than the regular S8 and S9. Something to keep in mind. Can cell phones cause cancer or other health problems?? At the same time, the age of cell phone users has lowered dramatically. While radiofrequency radiation is a form of electromagnetic radiation, it is non-ionizing (similar to extremely low frequency, or power frequency), as opposed to ionizing radiation (like x-rays, radon, and cosmic rays). This is an important distinction, because exposure to ionizing radiation is known to increase the risk of cancer, but there is currently no consistent evidence that non-ionizing radiation increases cancer risk in humans. The potential health effects of non-ionizing radiation from radar, microwave ovens and cell phones have a long research history. The only recognized effect of radiofrequency radiation in humans is heating. 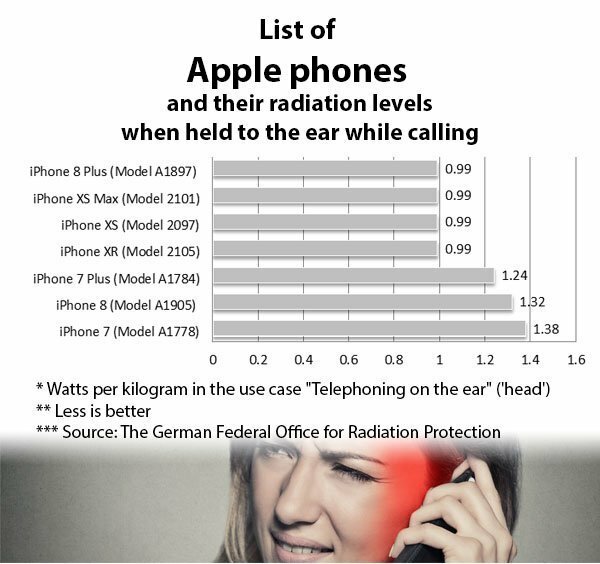 Radiofrequency exposure from cell phone use does cause heating to the ear and head. However, this is not sufficient to measurably increase body temperature. The reality is that most of the conventional studies of potential cell phone radiation health concerns have been inconclusive, with the studies showing some health issues in the minority. On the other hand, experimental studies have shown that the levels of radiation from cell phones can cause tumors, heart schwannomas and other growths in rats. While further studies are ongoing, it is safe to say that there is no reliable proof that cell phone radiation can cause serious health issues and even scientists who believe there are health risks associated with cell phone radiation can’t point to a study with a clear and demonstrable proof. So I don’t think we can expect a government agency stepping out and speaking about phone radiation any time soon. I hope this article motivates you to do some research, so you can decide for yourself on the dangers of cell phone radiation. For me personally, after going through all of the studies I could find, it’s difficult to lean one way or the other. I cannot say it’s dangerous, as there is objectively no conclusive evidence. Then again, some studies make some connections. It currently seems as one of those areas where we personally have to decide if it is something we should consider. I would say, again, in my personal opinion, that there is enough research links and hints to at least make me think about phone radiation and make sure the phone I use doesn’t emit more radiation than other similar models. It’s hard to put benchmark to what is ‘safe’ or ‘reasonable’ phone radiation, but the German Certification for Environmental Friendliness has set the standard to 0.6 watts per kilogram and currently we don’t have anything better to go by. If you are wondering about your own phone’s radiation levels, you can find it here.